Level 4B Student Resource NZ Maths Book from CaxEd works in partnership with Level 4A and fully covers all of the New Zealand Level 4 curriculum achievement objectives. The emphasis is on connecting the strands by pointing out where numeracy strategies can be used in other strands and also using Geometry, Measurement and Statistics in the Number and Algebra strand wherever possible. Your students will love the new characters and exciting student focused activities, discussions, games, puzzles, practicals and investigations. 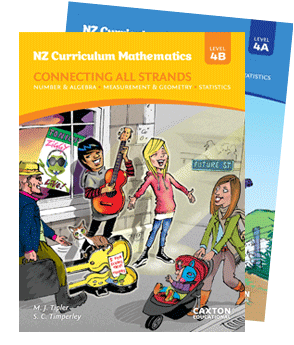 There are two NZ Maths books to cover each of levels 2, 3 and 4 of the curriculum. Book A covers the earlier part of each level and Book B covers the later part. A starter activity and a check up on the skills students need to know at the beginning of each chapter. Click here to see the four pages of Contents of the second book in the new series, book Level 4B, written for the later part of level 4 of the New Zealand Curriculum. Click here to see sample pages of Level 4B.